Let Clients edit content on-line live without WebPlus. New PRO PLUS Version! No Flash! Uses PHP and CSS. Automatic creation of thumbnails. Thumbnails will be cropped automatically to fit the thumbnail allocated spaces. Fully Customisable via a simple to use Impact CMS page. Add Titles, details and post date. Split images into Categories (Up to 6) which can be added to client sites individually, i.e. Gallery with a specific Category displayed as default, or display Main Category and all Categories in a single Gallery. Automatic RSS Feed generated as images are added. Client adds images and manages the gallery directly on their website or in Impact CMS control panel. Supports jpg or png files. All file names are automatically converted to lower case. png files are automatically converted to jpg and saved as such. Transparent png’s transparency is set to white. Images should be at least 500px wide images larger than required to fit the photo display will be proportionally re-sized to fit. Optional - Comments can be enabled to allow visitors to add their comments. As added comments are emailed to the specified address so they can be easily moderated and deleted where necessary. Mobile size News, Events and Shop Panels to add to your client's 320px wide mobile sites. 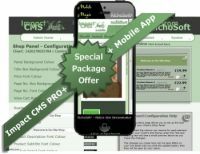 Mobile Shop panel automatically uses PayPal Mobile Payments. 'Sticky' items in News and Events Panel (Allows fixing of selected items at the top of the lists in the panels. New - Foto Book Gallery - One per client. What is new in PRO? Customisable Client Log-In panel that can be added to client sites or your own main site(s). New log-in panel can take clients to easy customisable Control Panel pages with your own easy to add branding. New Images in light boxes - a unique version that shows the cropped image as the clickable thumbnail, that when clicked displays the complete image in a lightbox. New PDF Catalogue/Document feature that allows users to update a pdf document attached to a thumbnail. When they upload their PDF the thumbnail is automatically updated to an image of the first page of the PDF. Also adds a view and download link. New easily customisable News Panel via control panel where clients can add (via the page it is on) new news items, disable items and edit items. New easily customisable Events Panel via control panel where clients can add (via the page it is on) new events, disable items and edit items. The events are displayed in reverse event date order so the ones coming up soonest are displayed first. Events are automatically removed from the display when the event date has passed. New easily customisable Mini Shop Panel via control panel where clients can add (via the page it is on) new products, disable items and edit items. A custom cart is included and submission via PayPal is automatic. Just enter the clients PayPal email address and everything is done for you.Easily customisable via the control panel. One News, Shop and Events panel can be set up for each client, each one separately customised. New automatic subscription set up for clients, simply set the cost per month/quarter/year for each client and they can set up their subscription to your paypal account in a couple of clicks. New enhancements and code updates. Automatic Forgot Password procedure for users.